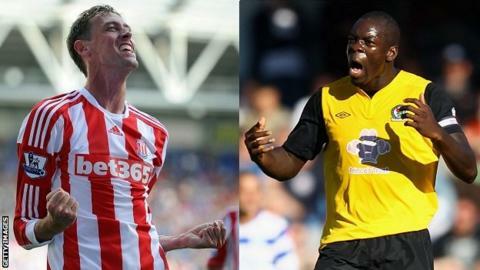 QPR manager Harry Redknapp is targeting Stoke City striker Peter Crouch and former Blackburn Rovers defender Christopher Samba. Redknapp is working on several deals ahead of Thursday's transfer deadline - although he admits he is not yet close to signing the pair. Crouch, 31, played for Redknapp at Southampton, Portsmouth and Tottenham. Crouch, had a spell at Loftus Road at the start of his career. Redknapp told BBC Sport: "These are two players whose names have been mentioned but at the moment we're not close to doing anything. Crouch's name came up in a meeting with the chairman but I don't think Stoke want to sell him. "On Samba, again the chairman is dealing with this. At this stage I don't think that's a goer. I like Christopher Samba and he is a very good player but at this stage I don't see him leaving Russia. Things can changes but at this stage we're not close to doing anything." Redknapp also confirmed he is attending an appeal on Tuesday in the hope of attaining a work permit for South Korea left-back Yun-Suk Young, who plays in his homeland for Chunnam Dragons. QPR, who play Manchester City at home on Tuesday, are bottom of the Premier League, five points from 17th-place Aston Villa. Redknapp took over from Mark Hughes in November with the team without a win in the first 12 games of the league season. A £6.6m deal for fellow France international Yann M'Vila from Rennes broke down when the midfielder signed for Russian club Rubin Kazan for £9.6m.